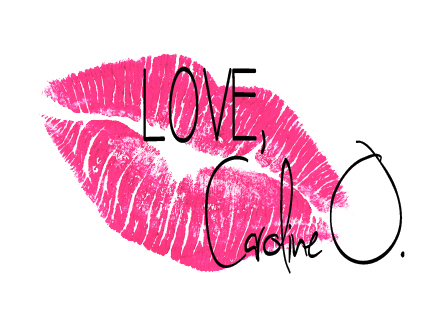 4 Easy Rules to Makeover Your Closet - Love, Caroline O.
Hello, my name is Caroline, and I’m a clothes hoarder. As a recent college grad, I had my first (real-life) job interview. Now I’m all about image, and when I was looking for the perfect interview outfit in my closet, I couldn’t find anything that was classy enough, long enough, or professional enough. In fact, I didn’t even own slacks. I couldn’t think of a better time to give my closet a makeover. My goal: get rid of everything that screams Seventeen and replace it with everything that hints Vouge. 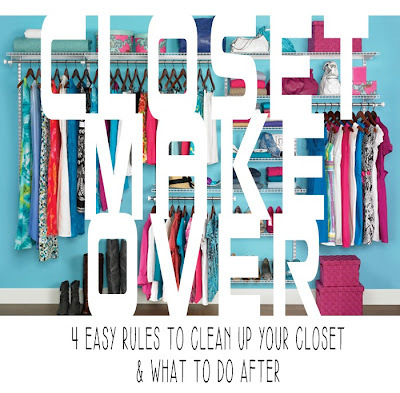 Regardless of your reasons, here are a few simple rules on the basics of giving your closet a makeover… and what to do after! Before you get started, figure out why you want this change and decide what direction you want to take. I guarantee that setting a goal will make the process a whole lot easier! Tell yourself what types of clothes you want to get rid of and the style you hope to have at the end. The reason may be as simple as summer cleaning or as complicated as adjusting to the trends of a new location. If you’ve gained or lost weight, make it a point to get rid of clothes that don’t fit you and replace them with clothes that compliment your shape. For me, I wanted to trade in my college tees for a more sophisticated style. Can’t decide what direction to take? Look back at your most recent pins or the celebrity who’s style you keep Googling. In my case, I took advice from my two favorite fashion gurus—Stacy and Clinton! Rule 2: Just get rid of it! When comes to getting rid of that dress you haven’t worn in years, it suddenly develops sentimental value in your mind. If you haven’t used it in a while, there’s a reason for it! Unless it is an item that is meant another season, don’t let something take up valuable space in your closet. If you haven’t worn it in forever, if you’re only keeping it because your mother-in-law gave it to you, if it’s not age appropriate, if the leather is worn down to the bone of the shoe, just get rid of it! You are making way for new and better items! Still can’t do it? Give those favorite pieces to a close friend or relative to “hold” for you. I’ve had one of my friend’s dresses for two years, which is around the time I lost interest in that Betsy dress. When she asked for it back, I was more than happy to give her the dress, allowing space for something new! I have a pile of clothes that just needs to be taken in/ needs new buttons/ would look great with lace pockets. Here’s the deal: get a seamstress or learn to sew… otherwise refer to rule #1 (get rid of it)! You can easily find a cheap seamstress on Craigslist, and you might even be able to negotiate a price for bulk. If you don’t want to spend that money, you still have options. Ask a family member to do you the favor. Chances are, grandma sews like a BAMF. You can also watch YouTube videos to learn how to hand sew. Although it might take a little bit longer, hand sewing is better than no sewing and letting a pile of great clothes go to waste. Set aside one or two hours a week to work on all that clothes you promised yourself you would get crafty with sooner or later. I’m loud and proud about being a winter-hater. In my opinion, the only good thing about the cold seasons is my winter closet, full of scarves, boots, and sweaters. Don’t keep bulky winter items in your closet. Separate closets by seasons. Texas has hot weather and not-so-hot weather, which means I usually have my summer closet out year around. I hide my winter closet in the bottom dresser, but I know most girls that keep their winter closets hidden under the bed. Wherever you put it, hiding clothes from yourself makes it fun to find. You get to discover a whole new wardrobe that’s appropriate for the weather; it’s almost like giving yourself an early Christmas present. For snow bunnies, hide your colorful flip flops, shorts, and bikinis! When cleaning out our closet, clean out your seasonal clothes at the end of the season. I know a dozen pieces I would have thrown away had I not hidden them for the right season. Make that Ca$h: With stores like Buffalo Exchange, Plato’s Closet, and a number of other resale shops popping up all over the country, it’s easy to get money back for trendy, well-treated clothes. Here’s how resale shops work: A resale shop will take in your well-handled clothes, shoes, purses, and jewelry in exchange for cash or credit at their store. They only take a certain number of bags of clothes a day, so get there early. Believe me, girl, you’re not the only one doing this. Some stores require you to take the clothes on hangers, while others let you bring it in trash bags. Also, don’t forget to take in a form of identification. Don’t expect resale stores to want to buy everything from you, in fact, this rarely the case. Start by taking your items to well-known resale shops (like Buffalo and Plato’s) and end at the locally owned shops. When your bags of clothes are almost down to nothing, donate them to your local Goodwill or any second-hand store. Usually the larger thrift stores will give you a tax receipt or, better yet, a coupon for the next time you shop there. I know Savers would always offer me a 30% off my next purchase every time I donated items. Score! Around the time I decided to clean out my closet, my sister and most of my friends were doing the same. My sister gave me a few shirts from her closet that I had been eyeballing for quite some time. I also got to scavenger through the trash bags of clothes my friends didn’t want. I practically rebuilt my closet by doing this! 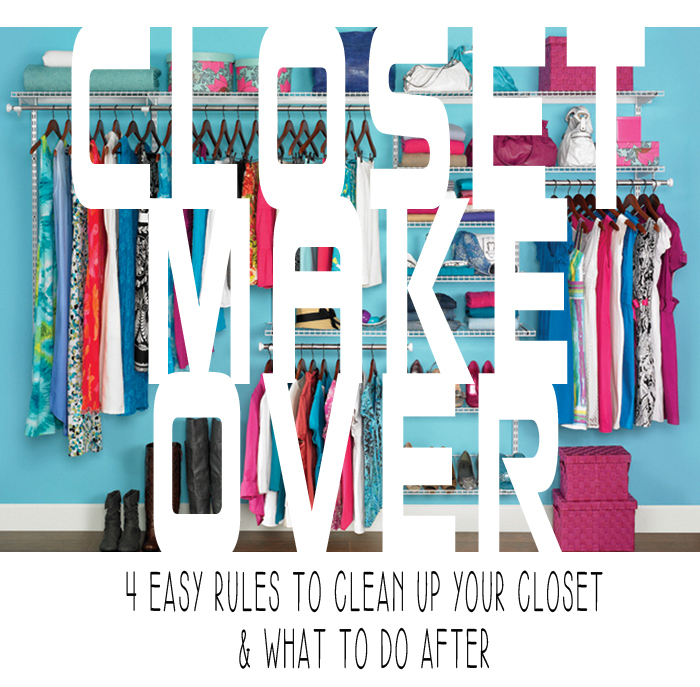 Ask your friends if they are also cleaning out their closets, and offer a clothes exchange. Gather a group of friends and make an event out of it. (If you have vicious girlfriends, better keep it exclusive!) Even if your bestie is a different size than you, keep in mind that she might have a couple of scarves and shoes you may like. The hardest part of all this—don’t change your mind while reselling or giving away your clothes! Be strong. You can live without those pants, promise! The silver lining—you get to rebuilt your wardrobe. Have fun!